Portfolio yields are under pressure due to the worldwide flight to safety over the last few years, making conservative and income growth portfolios more difficult to manage. While bond investments made a few years ago have done historically well, new investments have greater principal risk with low historic yields. Some advisors have simply shifted from bonds into stocks, but for those truly in conservative and income growth risk classes, adding equities will increase the portfolio’s standard deviation, a common measure of risk, reducing the portfolio’s ability to soften the “blow” from the next crisis or even modern day volatility. Investors should never chase yield, meaning simply buying the highest yielding product with no concern about who is paying the interest. No company pays a high yield on its bond simply because they just want to be nice. Yield is based on the risk of getting your money back. A US Treasury Bond pays a lower yield because chances of getting paid back are nearly 100%. If you lent money to General Motors several years prior to bankruptcy, you got a very high yield, but then lost your entire principal after the government takeover. Lending money to Coke would fall in between the US government and GM. Coke is not as secure as Uncle Sam, but the risk of Coke going out of business in the near term is not realistic either. A way to increase portfolio yield and not increase overall risk is to reallocate a portion of your equity holdings into dividend-paying domestic and international index funds and preferred stock. Every conservative or income growth portfolio has some exposure to equities. A sample income growth model is listed in the table below. The portfolio is made up of 30% equities, 60% bonds, 3% commodities and 10% cash. The current 12-month yield is 2.7%, with a 5-year 5.78% annualized rate of return through December 31, 2010. The 5-year standard deviation is 9.6. The portfolio is made up entirely of index funds. Over the same time period, the S&P 500 had a standard deviation of 18 and a return of 2.29%. Below, I explore the options in using exchange-traded funds to supplement the equity allocation in the above portfolio. Simply adding exchange-traded funds (ETFs), like Vanguard’s Dividend Appreciation Index (VIG), to a portfolio can increase a portfolio’s yield. VIG holds over 140 large cap companies that have increased their dividends consecutively over the last 10 years. The fund yields 2%; this is 10% higher than the S&P 500. According to Morningstar, VIG is allocated with 50% giant, 35% large, 12% mid and 2% small cap domestic exposure. VIG’s expense ratio is 23 bps. This fund has $4.6 billion in assets under management. As of 12/31/10, VIG had a 3-year rate of return of .2% with a standard deviation of 18.69. State Street’s SPDR S&P Dividend ETF (SDY) tracks the S&P Dividend Aristocrats Index, which holds 60 S&P 1500 companies that have increased their dividends every year for the last 25 years. The companies must have a market cap of at least $3 billion and an average trading volume of $5 million for at least six months. The fund currently yields 3.35%. Morningstar breaks down this Large Cap Value ETF with 17% giant, 34% large, 39% mid and 9% small cap companies. The expense ratio is 35 bps. This fund has $5.2 billion in assets under management. As of 12/31/10, SDY had a 5-year rate of return of 3.31% and a 5-year standard deviation of 18.63. The iShares Dow Jones Dividend ETF (DVY) currently yields 3.42%. This ETF tracks the Dow Jones Global Select Dividend Index. The methodology behind this index is to track the top 100 yielding stocks in the Dow Jones US index, excluding REITs. Morningstar divides this ETF as 11% giant, 37% large, 35% mid and 15% small cap stocks. The ETF has $6 billion in assets under management with an expense ratio of 40 bps. As of 12/31/10, DVY had a 5-year rate of return of -.2% with a standard deviation of 19.02. Many advisors would consider VIG, SDY and DVY to be the same. However, just a quick study of their underlying index methodology tells a different story. VIG could be used as a core asset allocation strategy to replace value/growth neutral holdings. It should also be noted that this ETF holds only 6% financials. SDY can be used in portfolios where growth and value holdings are strategically allocated. 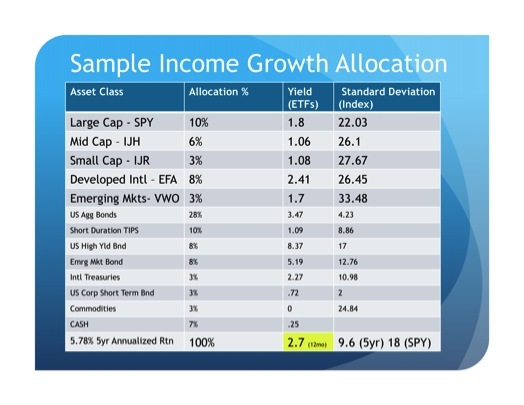 Traditional large and mid cap holdings could be reduced and SDY used to supplement portfolio yield with equity dividends. DVY is more tilted towards value compared to SDY and carries more small cap equities. 70% of holdings are in the US manufacturing sector. This ETF could be used as an alternative to SDY, but it is still not an apple-to-apple comparison. Preferred stock is a hybrid between a bond and a stock. I always tell my clients a stock gives them voting rights, but if the company goes out of business they could lose their principal. If you hold the company’s bonds, you do not have a voting right, but you get regular income from the bond and possibly a desk or a forklift (collateral) if the company folds. A preferred stock gets a higher dividend than the common stockholders and preferred shareholders get paid first. The higher dividend is closer to the bond yields and you can get equity-like returns. This, of course, does not mean that preferreds should be chosen over common stock. Preferreds are generally related to financial and utility companies. It should also be noted that, as seen in the chart below, preferred stock did not hold up well during the financial. However, with 7% yields and a financial industry bailed out and healthier, perhaps the future risks of preferreds will be less than the past three years. iShares S&P US Preferred ETF (PFF) tracks the S&P US Preferred Stock Index. The ETF currently yields 7.32% with an expense ratio of 48 bps. The index is comprised of U.S. traded preferred stocks that meet criteria relating to minimum size, liquidity, exchange listing and time to maturity. The index is calculated with a modified capitalization weighted scheme, with modifications being made to index shares to prevent single issuer concentration and improve index liquidity. The index is rebalanced on a quarterly basis. Virtually all of PFF’s (83%) holdings are in the US financial sector. PFF currently has 220 holdings and $6 billion in assets under management. As of 12/31/10, PFF had a three-year rate of return of 6.81% and a standard deviation of 33.28. State Street offers SPDR Wells Fargo Preferred Stock ETF (PSK). PSK tracks the Wells Fargo Hybrid and Preferred Securities Aggregate Index. The index methodology seeks to track non-convertible preferred stock and securities that are functionally equivalent to preferred stock, including but not limited to, depositary preferred securities, perpetual subordinated debt and certain securities issued by banks and other financial institutions that are eligible for capital treatment. PSK holds 160 preferred stocks, with $106 million in assets under management. 83% of the ETF’s holdings are in the finance sector; 5% are in utilities. The fund’s expense ratio is 45 bps. This ETF was created on 9/16/2009, thus we have no 3 or 5-year data. ETF provider PowerShares offers two ETFs covering preferreds. PGX, the PowerShares Preferred ETF, tracks the BofA Merrill Lynch Core Fixed Rate Preferred Securities Index. The index tracks investment-grade preferred securities. The index is rebalanced on a monthly basis. The ETF has 70 holdings, $1.3 billion in assets, a yield of 6.74% and an expense ratio of 50 bps. This ETF began trading on 1/31/08, thus we do not have three-year data. PGF – PowerShares Financial Preferred ETF tracks the Wells Fargo Hybrid and Preferred Securities Financial Index. The index captures US listed securities issued by financial institutions. The ETF has 45 holdings, a yield of 7.08%, $1.7 billion in assets and an expense ratio of 65 bps. As of 12/31/10, this ETF had a three-year rate of return of 1.6% with a standard deviation of 39.78. Each of these preferred stock ETFs is uniquely different, with iShares’ PFF holding the most assets and carrying the title of most diversified. Adding a small percentage of preferred stocks to a portfolio can boost overall yield. Investors should also note the high standard deviation of these indexes/ETFs. MSCI EAFA has been a staple in investing outside the United States for many years, covering Europe, Australia, the Far East and Asia. Taking another look at dividend weighted or focused ETFs investing in companies outside the US with will help boost portfolio yields. State Street’s SPDR S&P International Dividend ETF (DWX) tracks the S&P International Dividends Opportunity Index. The index is designed to measure the performance of the 100 highest dividend yielding common stocks and ADRs listed in primary exchanges of countries included in the S&P/Citigroup Broad Market Index. The ETF yields 4.23%, with $343 million in assets under management and an expense ratio of 45 bps. Morningstar indicates that the fund is allocated with 10% giant, 30% large, 58% mid and 0% small cap international exposure. The fund currently holds 101 foreign companies. DWX began trading on 2/12/08 and does not yet have a three-year track record. iShares Dow Jones International Select Dividend Index ETF (IDV) tracks the Dow Jones International Select Dividend Index. The index tracks the top 100 dividend payers based with country and company weightings, rebalanced annually. The ETF has a 12 month yield of 3.94%, $358 million in assets and is tilted towards international large cap value. Morningstar breaks down the ETF’s 99 holdings cap size as 34% giant, 32% large, 31% mid and 1% small cap. The expense ratio is 50 bps. As of 12/31/10, the ETF has a three-year rate of return of -5.17% with a standard deviation on 31.93. WisdomTree offers an ETF that tracks the WisdomTree DEFA Index, ticker DWM. The index is fundamentally weighted and measures the performance of dividend paying companies in the industrialized world (excluding Canada and the United States) that pay regular cash dividends and meet other liquidity and capitalization requirements. The ETF is tilted towards international large cap value with a Morningstar reported cap size of 54% giant, 28% large, 14% mid and 2% small. There are currently 636 companies in the ETF, providing the portfolio a yield of 3.24%. The expense ratio is 48 bps and it has $418 million in assets. As of 12/31/10, the ETF has a three-year rate of return of -8.3% and a standard deviation of 26.5. Reviewing these three options, WisdomTree’s DWM offers the largest diversification and a lower standard deviation. However, the ETF also has the lowest return: -8.3%. When comparing ETFs or building portfolios using ETFs, the investor often does not have enough history to back test theories and strategies. A way around this is to actually look at the raw index performance. An investor cannot invest directly into an index but it certainly gives him or her guidance as to the expected performance of the ETF. The ETF will not track the index exactly as fees, portfolio optimization and illiquid or poorly priced securities will cause tracking error. Tracking error is something that should always be observed before investing in an ETF. For the purposes of this portfolio, we will simply focus on yield and risk. Referring back to our original portfolio, we will add 4% of SPDR S&P Dividend ETF (SDY), 8% of the SPDR S&P International Dividend Opportunity ETF(DWX) and 4% of the iShares Preferred Stock ETF (PFF). Our goal is to keep risk virtually unchanged while also increasing yield. In our portfolio, we are willing to have a value tilt in domestic and international large cap and take on a small percentage of preferred stock. The results can be seen on the chart below. With our changes, yield increases from 2.77% to 3.2%, a 15% increase; 5-year return was up from 5.78 to 6.08%. Overall portfolio risk did increase slightly, but our Sharpe Ratio, a measure used to see if additional risk is being compensated for, increased from .39 to .41. While investors and advisors may not have chosen the same ETFs used here, the point is to show that a reallocation of equities can increase portfolio yield while keeping overall risk in check.